Ken Hite's Suppressed Transmission refuses to stay dead . . . which is as it should be, since Ken's work on the column is one of the highlights of Pyramid's past. Recently, in a thread at RPG.net, longtime fan Jurgen Hubert has started writing about all 300 columns in the series. Why would he do such a thing? Because he absolutely loves the series and he is trying to build up sales of the existing compilations so that we'll look into publishing a complete collection of all 300 columns. Chris Helton write about the series at his blog. Tyler of Held Action post his own thoughts on the series at his own blog. A slight increase in sales of the two existing PDF compilations. So far there hasn't been enough of a sales spike to lead me to push for the creation of that collection, but I promise you that all of us are watching the PDF sales and will continue to discuss the possibility of a complete Suppressed Transmission book. After all, we know that they want this collection. Postscript from Steve: I want this book too. 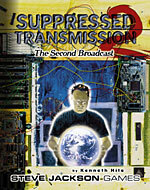 Suppressed Transmission was an absolutely engrossing, eye-crossingly neat column. I was proud to publish the first collections, and, to be honest, I was crushed that the mainstream, which just drools over conspiracy stuff these days, never even seemed to notice them. Sure, Ken's writing is too smart for the mainstream. But Dr. Seuss was too smart for the mainstream, too, and yet they bought. Oh, how they bought! Without having any idea just what Yertle represented, or who Horton really heard. But now I'm revealing too much. Back to the topic: Buy Ken's books, and tell your smart friends about them, and maybe we can publish more.